The only stitches you need to know are single crochet, half-double, double, and treble. While that sounds like a lot, all of them are variations on the same stitch, so if you can do a single crochet stitch, you can make this blanket! The main part of the pattern isn't original with me, I found it here on Ravelry. However, I did figure out and add the border. The blanket just looked so unfinished without it. Adding the border, though, really finished it off nicely and gave it a much more completed and professional look. This blanket looks great in any number of different colors, and really, I think it would look great as a blanket for grown-ups, too, if it was made a little bigger. It would be perfect for snuggling up with on the couch while reading a good book or watching a favorite movie. 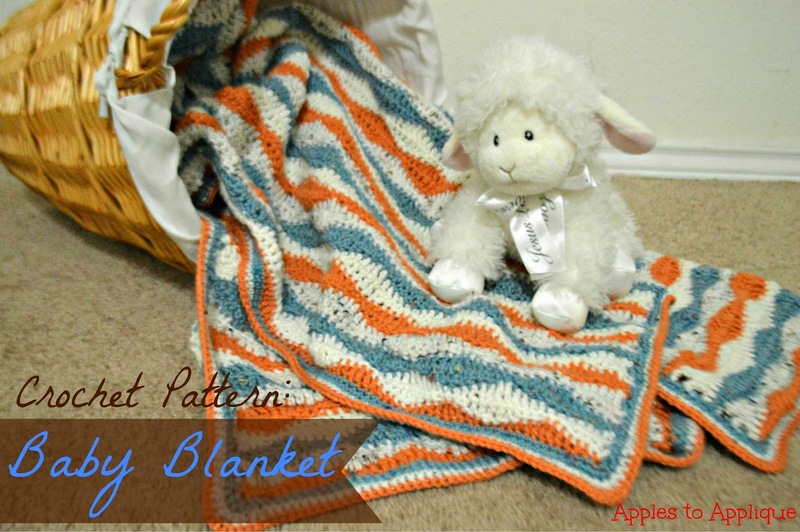 The pattern is for a crib-sized blanket. I actually made mine a little bigger, because I like big, over-sized baby blankets to lay on the floor, but the dimensions I'm giving you are for the original crib-size pattern. To make it longer, just add more stripes until you are happy with the length. Easy, right? To make it wider, add to the pattern in increments of 12 stitches in order to not mess up the pattern. You can see the pattern is made up of wavy stripes; each wavy stripe is made up of two rows of crochet in the same color. In this picture you can see the top stripe is halfway finished; one row of stitches has been completed in the ivory tweed. In this next picture, the second row of ivory tweed has been stitched, and that stripe is completed. To make the waves, each wide part of the stripe is made of treble crochet stitches stacked on top of one another, double crochet stacked together, half double crochet stacked, and single crochet stacked. Each stripe is made the exact same way, except they are off-set from the one before it, so that the wide part of each stripe is nestled against the narrow part of the stripe before it. Notice in the picture below how I've just completed two treble crochet stitches at the narrowest part of the stripe before it--the part formed by single crochet stitches. That's pretty much all you need to know to make this blanket. You really don't need to count or keep track of stitches too much; after a few rows you'll be able to complete the pattern in your sleep. If you lose track of where you are, it's super easy (once you get past the first row) to tell exactly which stitch you need to use next just based on the row before. The only exception is with the two ends of the blanket. To complete these, you will actually use use "half" stripes (made of one row of crochet) in order to keep the blanket square. See how my blanket started here with half of an orange stripe so the end is straight instead of wavy? That's all there is to this blanket! Just a repetition of a few simple stitches, put together to make this pretty pattern. Row 1: 2 sc, *2 hdc, 2 dc, 2 tr, 2 dc, 2 hdc, 2 sc* Repeat from * to * to end of row. Row 2: Ch 4 This counts as your first treble stitch! In 6th space/stitch from hook: 1 tr (in addition to the chain), *2 dc, 2 hdc, 2 sc, 2 hdc, 2 dc, 2 tr* Repeat from * to * to end of row. Row 3: Repeat Row 2 exactly. Treble stitches will be on top of trebles, doubles on top of doubles, etc. Row 4: Ch 2 This counts as your first single crochet stitch! In 3rd space/stitch from hook: 1 sc (in addition to the chain), *2 hdc, 2 dc, 2 tr, 2 dc, 2 hdc, 2 sc* Repeat from * to * to end of row. Continue working rows 2 through 5 until desired length is reached; end with a row 5. With Color A: Ch 2 This counts as your first single crochet stitch! Begin next stitch in the 3rd space/stitch from hook: 1 sc, *2 hdc, 2 dc, 2 tr, 2 dc, 2 hdc, 2 sc* Repeat from * to * to end of row. Break yarn; weave in all ends before starting border. Adding the border is pretty simple. The entire thing is made up of single crochet stitches. On the ends of the blanket, you simply sc in each space/stitch. On the sides of the blanket, however, since you are working perpendicular to the previous stitches, this won't work. 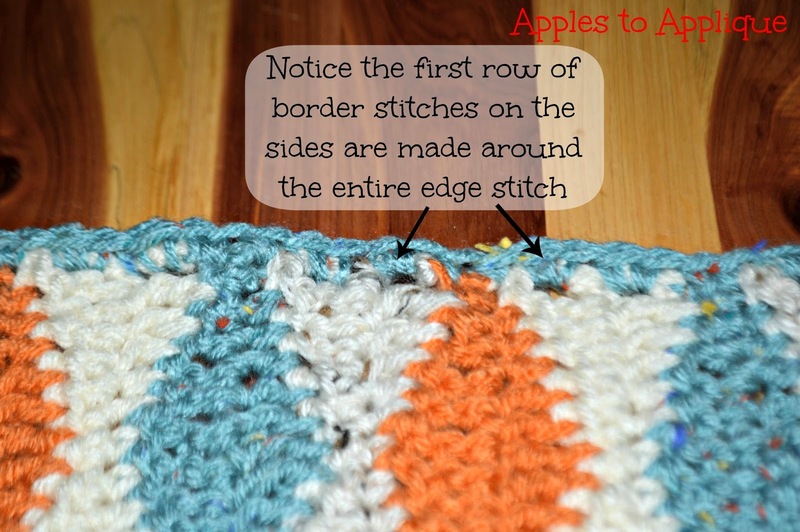 The first row of stitches in the border is what I call the foundation for your border; after it is in place, you simply sc all the way around for subsequent rows, except at the corners, which I'll explain in a minute. 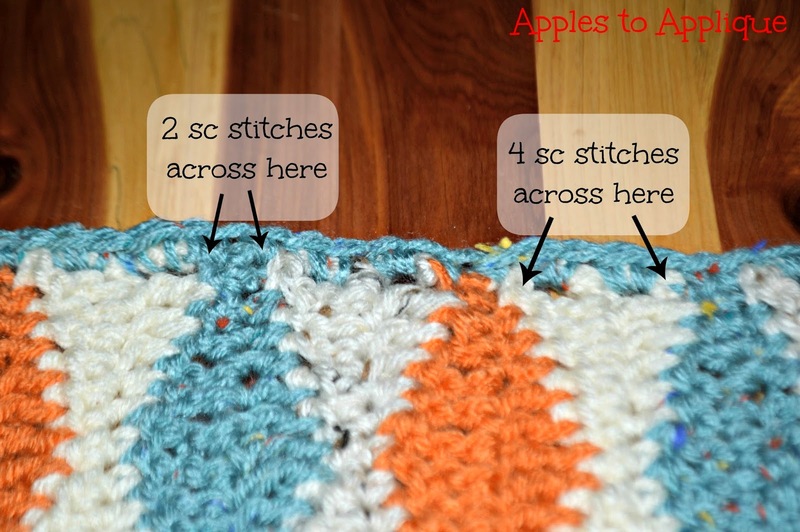 To set up your foundation, sc across the end of the blanket, and on the sides, since there is no exact stitch space to use, you will stitch around the post/stitch on the outside edge of the blanket. Hopefully this picture can better explain what I mean. It doesn't look super "neat" at this point, but stay with me. Remember I said this is just the foundation. I promise the finished product looks better! Another problem with stitching perpendicular to the original stitches is figuring out how many stitches to use to ensure that the border won't curl (too few stitches) or become wavy (too many stitches). I found the right ratio seemed to be 4 sc for each wide stripe, and 2 sc for each narrow stripe (see picture below for more clarification). I crocheted the sides slightly looser than normal, and the final result laid pretty well. 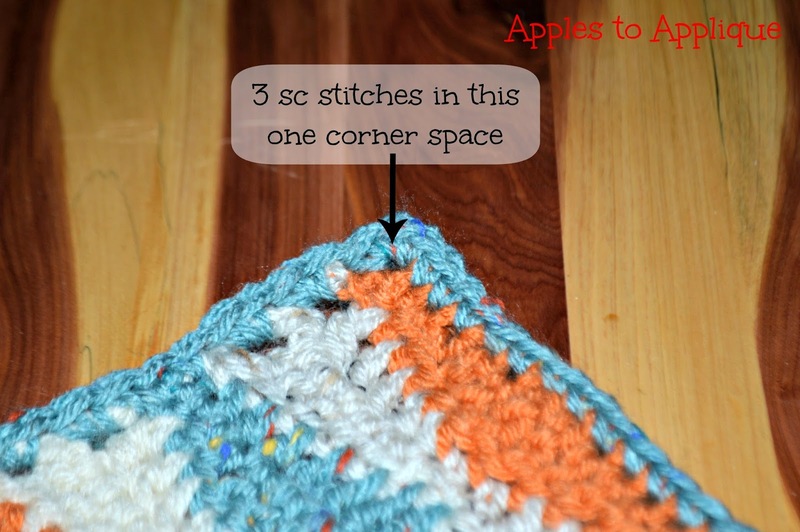 At the corners on the foundation row, you will still use a single crochet stitch, but you will put 3 of them at each corner. This adds the little bit of extra room you need to round the corner. Once that foundation row is in place, you're all set! Simply sc your way around the foundation row, with the exception of the corners. For each border row I add, I add an extra 3 stitches or so to the corner. While I did 3 sc in the one corner space on the foundation row, for subsequent rows I usually do 2 sc each in the corner space and the stitch on either side of it. (In other words, those 3 sc in the corner each get 2 sc stitched in them in the second row.) Then for the third and fourth border row I still just do 2 sc in each of the 3 corner stitches. I like to do one more row in the same color as my foundation row, because the stitches on the side of the blanket don't really show off the color of the foundation row as much as I would like. Here's how the side looks with the foundation row and the next row completed in the same color. See, I told you it ends up looking much neater! I like to add one or two more rows beyond that. For this blanket I opted for 4 total border rows (including the foundation row) in 3 colors. The border really makes this blanket, and takes it from looking okay to looking finished and professional. I absolutely love it! I hope that all makes sense; it really is a simple blanket. If you have any questions, or something is unclear, please don't hesitate to leave a comment or send me an e-mail (you can find my address on my Contact page). I'll do my best to clarify it for you! Don't have the time or inclination to make one yourself? Visit my Etsy page to have me custom make one for you! Linking up with Treasure Box Tuesday, Worthwhile Wednesday, the Wednesday Roundup, and Crafty Thursday Obsessions. I used to know how to do this, but it's been so many years and I lost the gift. Well done. Thanks, Patti! I'm sure it's like riding a bicycle, and that you could pick it up again quickly. I learned the basics as a teenager, forgot how, and then watched YouTube videos to re-learn. I was surprised how much of it came back once I started crocheting again. I love the shape of those stripes! Such a cute blanket, baby or not! Thanks, Helen! I like the stripes, too, and I agree that this pattern could really be used for anybody! Thank you! I understand about having to be in a certain mood; I definitely go through phases where I crochet a lot, or knit, sew, etc. a lot. Aww, thanks, Joy! I appreciate the share and the kind words. It's always a pleasure joining Treasure Box Tuesday!